Japan has adopted a nuclear fuel cycle policy since it began using nuclear power. 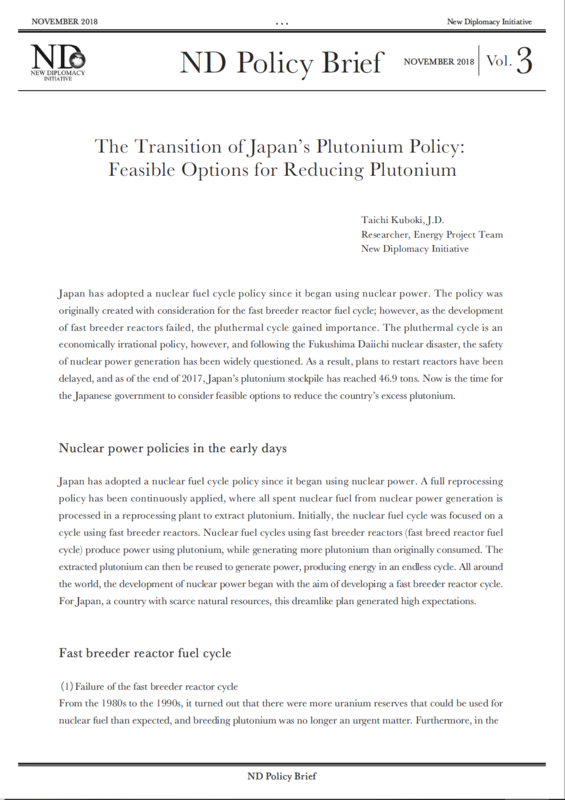 The policy was originally created with consideration for the fast breeder reactor fuel cycle; however, as the development of fast breeder reactors failed, the pluthermal cycle gained importance. The pluthermal cycle is an economically irrational policy, however, and following the Fukushima Daiichi nuclear disaster, the safety of nuclear power generation has been widely questioned. As a result, plans to restart reactors have been delayed, and as of the end of 2017, Japan’s plutonium stockpile has reached 46.9 tons. Now is the time for the Japanese government to consider feasible options to reduce the country’s excess plutonium. Japan has adopted a nuclear fuel cycle policy since it began using nuclear power. A full reprocessing policy has been continuously applied, where all spent nuclear fuel from nuclear power generation is processed in a reprocessing plant to extract plutonium. Initially, the nuclear fuel cycle was focused on a cycle using fast breeder reactors. Nuclear fuel cycles using fast breeder reactors (fast breed reactor fuel cycle) produce power using plutonium, while generating more plutonium than originally consumed. The extracted plutonium can then be reused to generate power, producing energy in an endless cycle. All around the world, the development of nuclear power began with the aim of developing a fast breeder reactor cycle. For Japan, a country with scarce natural resources, this dreamlike plan generated high expectations. From the 1980s to the 1990s, it turned out that there were more uranium reserves that could be used for nuclear fuel than expected, and breeding plutonium was no longer an urgent matter. Furthermore, in the 1990s, due to many technical and economic challenges, major countries around the world including the United States, France, and Germany withdrew plans to implement fast breeder reactors. Japan maintained its position, but the road toward implementing a fast breeder reactor fuel cycle was long. In 1994, approximately 9 years after the main construction work began (1985), the Monju reactor achieved criticality at last. The following year, in 1995, a fire caused by a leakage of sodium forced operations to come to a halt. Afterwards, in December 2016, it was decided that the reactor, which had seen minimal operation, would be decommissioned. The Monju Nuclear Power Plant was in operation for only 250 days out of its 22-year life expectancy, but on 11 May 2018, the Board of Audit announced that 1.13 trillion yen (approx. 10 billion USD) had been invested in the plant. Furthermore, it is said that the cost of decommissioning the plant may exceed the government’s initial estimated figure of 375 billion yen (approx. 3.3 billion USD). The Japanese government announced the decommissioning of the Monju plant and simultaneously released a cabinet decision stating that it will adhere to the policy of promoting a nuclear fuel cycle while remaining committed to policy regarding the research and development of fast reactors. It should be noted that the objective of research and development in the government’s statement is not fast breeder reactors, but rather fast reactors. Fast reactors are similar to those in the Monju plant in that they are nuclear reactors that use fast neutrons from plutonium; however, they do not breed plutonium. It is said that by using fast reactors, the lifetime of radioactive materials in spent fuel can be shortened by 300-400 years through nuclear fission, while reducing waste toxicity. Nevertheless, there are still technical challenges with fast reactors, and there has yet to be any anticipation of practical application. Shortly after deciding to decommission the Monju plant on 20 March 2017, the Japanese government announced its intention to consider strengthening the Japan-France partnership on ASTRID, a fast reactor for industrial demonstration. ASTRID’s scheduled start date moved from 2006 to 2020, but in 2016, it was announced that the date would be further postponed to 2030. Moreover, at a meeting of the Ministry of Economy, Trade and Industry’s “Fast Reactor Strategic Working Group” on 1 July 2018, Nicolas Devictor, Programme Manager for the Nuclear Energy Division of the French Atomic Energy Commission, explained that “the need for commercial deployment of fast neutron reactors is seen as much less urgent, due to the current context of the uranium market” and that “France is considering reducing output to 100,000 to 200,000 kilowatts (from an initial planned output of 600,000 kilowatts).” These changes have destabilized the future of the Japan-France partnership on fast reactor development. Another nuclear fuel cycle that is different than the fast breeder reactor cycle is the “pluthermal cycle”. Pluthermal power generation produces electricity by using mixed oxide (MOX) consisting of plutonium as fuel in light-water reactors. The pluthermal method came after the concept of fast breeder reactors and was specifically mentioned for the first time in the “Long-term Program for Research, Development, and Utilization of Nuclear Energy” published by the Atomic Energy Commission of Japan in 1972. While the practical application of fast breeder reactors was being called into question, more weight was put on the pluthermal cycle policy. In the 1994 Long-Term Program, the fast breeder reactor cycle was regarded as the future of nuclear fuel recycling, however, at the same time, a concrete plan to implement the pluthermal cycle was established. In 1997, the cabinet approved measures regarding the promotion of an immediate nuclear fuel cycle and stated that the pluthermal cycle was the most reliable way of using plutonium to date, and it must be put into motion as soon as possible. The pluthermal cycle is not a complete alternative to the fast breeder reactor cycle. Recycling degraded plutonium recovered from the pluthermal process is difficult, and can only be done one to two times at most. Reprocessing technology for MOX fuel used in the generation of pluthermal power has not been put to practical use, and as a result, spent fuel must undergo geological disposal as is. Moreover, when Japan imported MOX fuel from France, the price France declared to customs was about ten times that of uranium fuel. The pluthermal cycle is simply a limited cycle and has no economic rationality. According to the Federation of Electric Power Companies’ “Plans for the Utilization of Plutonium,” released in September 2010, 16 to 18 light-water reactors were to use MOX fuel, and 5.5 to 6.5 tons of fissile plutonium were to be consumed each year. However, in light of the accident at the Fukushima Daiichi Nuclear Power Plant in March 2011, all light-water reactors in Japan were stopped. Of the light-water reactors that are currently in operation, only four are generating power using the pluthermal method –Takahama reactors No. 3 and No. 4, the Ikata No. 3 Reactor, and the Genkai No. 3 Reactor. It remains uncertain whether the Ohma Nuclear Power Plant, which is capable of loading MOX fuel in all of its reactor cores (process known as full MOX), will be restarted. In order to promptly consume plutonium as the Federation of Electric Power Companies has outlined, it is essential that reactors resume operations as early as possible. Nonetheless, the majority of Japanese citizens want to abandon nuclear power generation. Furthermore, while nuclear reactors fail to restart, the number of nuclear reactors capable of handling the pluthermal cycle remains uncertain. Although the fast breeder reactor cycle was not put into practical use, Japan has continued to separate plutonium from spent nuclear fuel at its Rokkasho reprocessing plant and reprocessing plants in France and England. Japan’s full reprocessing policy has resulted in the accumulation of 46.9 tons of plutonium (as of 2017). Plutonium can be converted for military purposes, and 46.9 tons is enough to create approximately 6,000 nuclear warheads. For this reason, the accumulation of plutonium is an issue from a non-proliferation perspective. Japan’s possession of a large amount of plutonium has resulted in security concerns from the international community. There is also the issue of the increased possibility of plutonium getting into the hands of terrorists. Japan maintains that it does not have a surplus of plutonium. In the 1991 paper entitled “Nuclear Fuel Recycling in Japan” (Atomic Energy Commission), it was stated that Japan “has a principle of not possessing surplus plutonium”. Thereafter, in 1997, Japan submitted a written commitment to the IAEA and international community entitled “Plutonium Utilization in Japan,” in which it promised to “uphold the principle of no surplus plutonium”. In the Basic Energy Plan of 2014, it is said that the government remains committed to the policy of not possessing plutonium without specific purposes. However, as mentioned above, 46.9 tons of plutonium have accumulated in Japan as of the end of 2017. Accordingly, more people has recognized that the government’s principles alone are insufficient. On 31 July 2018, the Atomic Energy Commission decided on a new policy for Japan’s plutonium inventory. The current amount of around 47 tons would be set as the upper limit, and going forward, the plutonium stockpile would not be increased and reduction efforts would take place. Prior to this, the same objective was clearly stated in the Basic Energy Plan. As this was the first time that plutonium inventory reduction was clearly mentioned, it can be interpreted as a step in the right direction regarding government policies. That being said, the full reprocessing policy is still being adhered to, and as specific and effective measures have not been identified, it is not certain whether reduction efforts will take place. Based on the Fukushima Daiichi nuclear disaster, when the future of nuclear power became uncertain, the Atomic Energy Commission recommended a switch to a flexible nuclear fuel cycle. It is shown that if the number of reactors decreases, the policy of direct disposal and storage, rather than total reprocessing, is economically advantageous. However, under the current Designated Radioactive Waste Final Disposal Act, disposal of spent nuclear fuel (that has not been reprocessed) is not permitted. If direct disposal remains illegal under the law, other disposal methods cannot be applied. One possible option for the existing plutonium is to transfer it directly to the United Kingdom, which has already proposed taking over and disposing plutonium for a fee. The Japanese government should take this opportunity to seriously consider specific and feasible measures to reduce its plutonium stockpile.